WNPower Review 2019: Is WNPower a Good Hosting? WNPower offers both Linux and Windows shared hosting with SSD storage and robust bandwidth. Those looking for WordPress hosting should check this provider out as their service is specially tailored for WordPress websites. Argentinian web host WNPower started as a hosting reseller company in 1999, but began hosting their own services in 2003. Since then they’ve grown to become one of the largest providers of website services in Latin America. They offer shared hosting, cloud VPS, and dedicated server services. Their shared hosting services are perfect for beginners and come with tools that make them an excellent choice for those looking for WordPress hosting. WNPOWER tools include an extensive set of WordPress tools that are perfect for those looking to build WordPress websites. Also, I like that WNPower offers free SSL certificates, saving you money over similar hosts. Beginners will like this provider as they offer both a website builder and an auto-installer for WordPress and other applications. 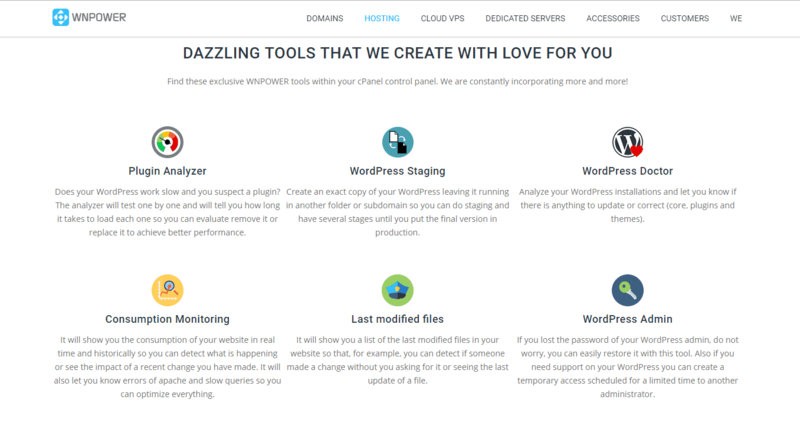 With their specialized WNPower tools, this provider is particularly suited for WordPress hosting. I don’t see a logical reason to go with the Starter plan unless you already own your domain and just need to host a very simple website. The free domain alone is worth the extra cost for Unlimited. Not surprisingly, your storage and bandwidth are somewhat limited on these plans. That’s the norm for many Windows hosting services. Also, you won’t get a free domain. Pricing on both Linux and Windows hosting is a bit better than you see on most hosts. However, with Windows hosting you’ll also have to pay for your own domain regardless of the plan. You do get a free SSL certificate on all plans, so that will save you money. WNPower has solid support including 24/7 live chat support, telephone, email, and ticketing support. As is typical of most web hosts, you’ll have to log in to your client portal to access the ticket system. They have both local and international support numbers. There’s also a fairly robust database including several step-by-step guides to walk you through various support issues. I was able to reach a live chat agent immediately, and they were extremely helpful and knowledgeable. WNPower offers solid basic shared hosting services, but the biggest selling point is their WordPress compatibility. Their WNPower tools offer WordPress webmasters more options than other hosts and make them a company worth investigating. Wondering how WNPower stacks up against other Web Hosting companies? Enter any other Web Hosting company and we will give you a side-by-side comparison.